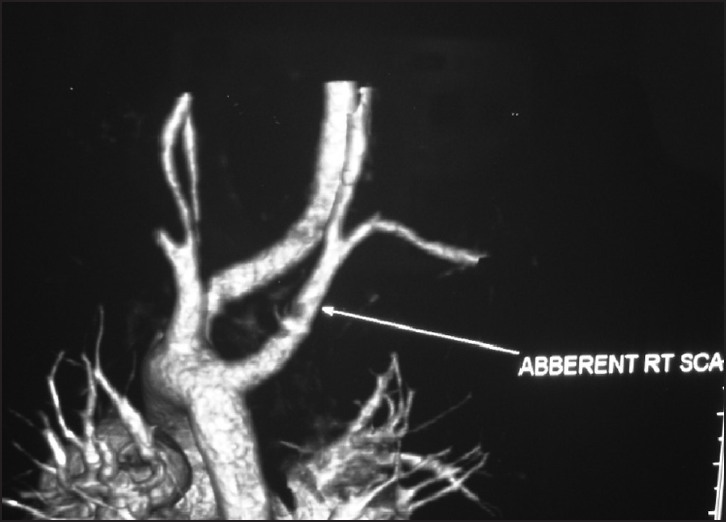 Various surgical approaches for aberrant right subclavian artery arising from the descending aorta and causing compressive symptoms have been described in the past. We describe our approach through median sternotomy to deal with this anomaly in association with an intra cardiac defect and believe that this is the optimal surgical approach in these patients. A four-year-old female child presented to us with complaints of dysphagia and regurgitation of solid food. 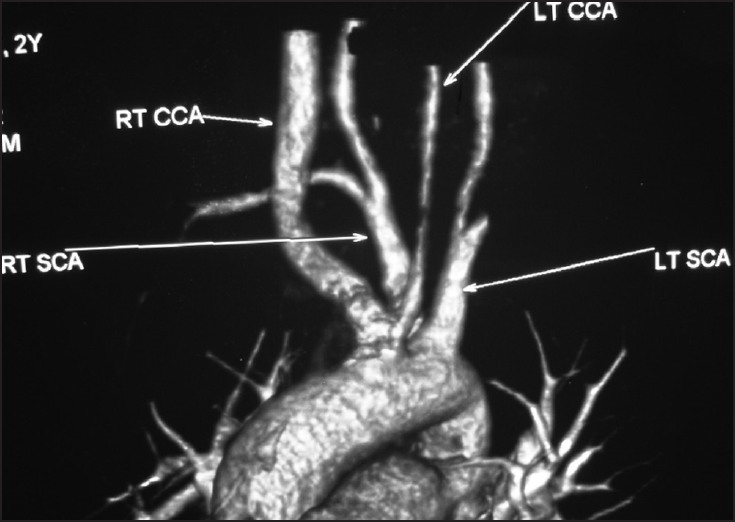 A contrast-enhanced CT scan (CECT) of the chest done elsewhere revealed an aberrant right subclavian artery [Figure 1]. A 256 slice CECT scan was ordered in our hospital for the exact anatomical characterization of the aberrant vessel. 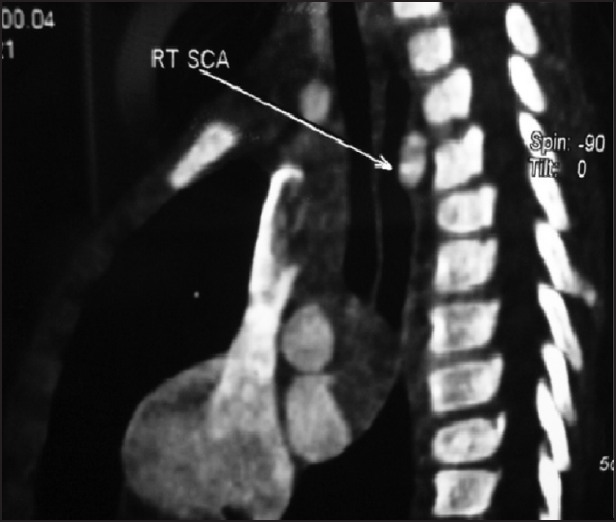 The scan showed an aberrant origin of the right subclavian artery from the medial wall of the descending thoracic aorta, just distal to the origin of the left subclavian artery [Figure 2] and [Figure 3]. The artery crossed to the right side at the level of the fourth thoracic vertebra, causing posterior compression of the esophagus. An additional finding that was noted was the common origin of the right and left common carotid arteries. The arch was left-sided, with a left descending thoracic aorta. An echocardiogram done showed a large ostium secundum atrial septal defect (ASD) of 20 mm, with a dilated right atrium and right ventricle. Under general anesthesia a median sternotomy was performed. The arch was followed down from the top and the aberrant right subclavian artery was identified just distal to the origin of the left subclavian artery on the medial wall of the descending thoracic aorta. Loss of the right radial artery trace on clamping the aberrant vessel confirmed that the vessel was indeed the right subclavian artery. The artery was carefully divided at its site of origin and the aortic end oversewn with two layers of continuous polypropylene sutures. The artery was next brought to the right side from behind the esophagus and the anastomosed end side to the right common carotid artery, after confirming that there was no torsion of the mobilized vessel [Figure 4]. Pericardial patch closure of the ostium secundum ASD was performed in a routine manner, under cardiopulmonary bypass, under mild hypothermia using the standard cannulation techniques. The patient had an uneventful postoperative course and was discharged on day six from the hospital. The patient had no complaints of dysphagia or regurgitation of food on discharge. Several approaches have been used in the past and are being used now for the surgical treatment of this anomaly. The supraclavicular approach on the side of the aberrant vessel can be used, as first described by Orvald and colleagues  and modified by Valentine and colleagues. 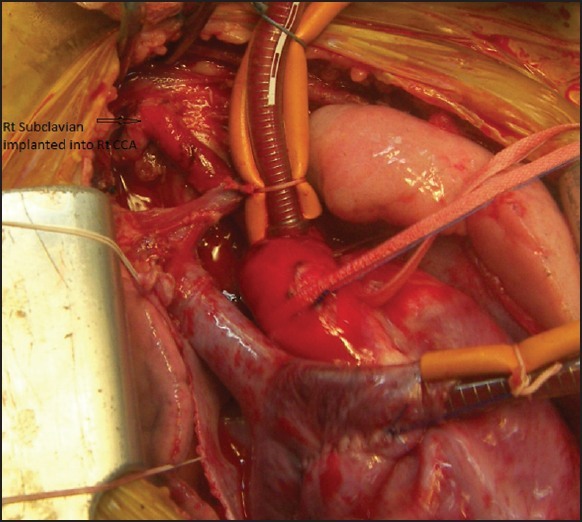 However, this approach may be useful only in cases requiring simple division and re-implantation of the subclavian artery, but an associated diverticulum or any other cardiac lesion cannot be dealt with through the same incision. The median sternotomy approach was first described by Shumacker. This approach is particularly beneficial if the patient has an associated intra-cardiac lesion, as in our patient. We believe that this is an ideal approach, as both the origin and the implantation sites are visualised satisfactorily, and bleeding can also be adequately controlled, with the possibility of institution of a cardiopulmonary bypass in case of inadvertent bleeding. In conclusion, we believe that anomalous origin of the right subclavian artery from the descending aorta is a rare surgical cause of dysphagia. Various surgical approaches can be used, each with its own advantages and limitations. However, we believe that median sternotomy is an excellent approach, especially if there is an associated cardiac lesion. 1. Bayford D. An account of a singular case of obstructed deglutition. Memoirs Med Soc London 1794;2:275-86. 2. Gross RE. Surgical treatment of dysphagia lusoria. Ann Surg 1946;124:532-4. 3. Richardson JV, Doty DB, Rossi NP, Ehrenhaft JL. Operation for aortic arch anomalies. Ann Thorac Surg 1981;31:426-32. 4. Zapata H, Edwards JE, Titus JL. Aberrant right subclavian artery with left aortic arch: associated cardiac anomalies. Pediatr Cardiol 1993;14:159-61. 5. Levitt B, Ritcher JE. Dysphagia Lusoria: A comprehensive review. Dis Esophagus 2007;20:455-60. 6. Klinkhamer AC. Aberrant right subclavian artery. Clinical and roentgenological aspects. Am J Roentgenol Radium Ther Nucl Med 1966;97:438-46. 7. Rogers AD, Nel M, Eloff EP, Naidoo NG. Dysphagia Lusoria: A case of an aberrant right subclavian artery and a Bicarotid trunk. ISRN Surg 2011;2011:819295. 8. Rahman HA, Sakurai A, Dong K, Setsu T, Umetani T, Yamadori T. The retrooesophageal subclavian artery- A case report and review. Kaibogaku Zasshi 1993;68:281-7. 9. Orvald TO, Scheerer R, Jude JR. A single cervical approach to aberrant right subclavian artery. Surgery 1972;71:227-30. 10. Valentine RJ, Carter DJ, Clagget GP. A Modified extrathoracic approach to the treatment of dysphagia lusoria. J Vasc Surg 1987;5:498-500. 11. Smith JM 3 rd , Reul GJ Jr, Wurash DC, Cooley DA. Retrooesophageal subclavean arteries: Surgical management of symptomatic children. Cardiovasc Dis 1979;6:331-4. 12. Bailey CP, Hirose T, Alba J. Re establishment of continuity of the anomalous right subclavian artery after operation for dysphagia lusoria. Angiology 1965;16:509-13. 13. Shumacker HB Jr, Isch JH, Finneran JC. Unusual case of dysphagia due to anomalous right subclavian artery. J Thorac Cardiovasc Surg 1971;61:304-8. 14. Ha GJ, Sung MJ, Lee YS, Lee JB, Ryu JK, Lee S, et al. A case of right sided aortic arch combined with atrial septal defect. J Cardiovasc Ultrasound 2011;19:32-4.